mad orange fools: The Big Day. At long last, my Etsy shop is up! Please check out the Mad Orange Shop. I have loads of felted handbags and bowls, plus a few one off things and some postcards printed from various Polaroid images. The selection will always be growing as I am always making new things. I have lots of ideas in the making and now the "getting it started" part of the shop is done, perhaps I will have more time for experimenting. This shop has been a long time coming and I am not sure why it took me so long to get it going. A bit of fear, I would say. And I'd like to say that now I have breathed a big sigh of relief, but not so much. Now my shoulders are all tensed up wondering how this little shop will be received. I know, I know, I need to just let it go and carry on. But this is what I have been doing for the past year. 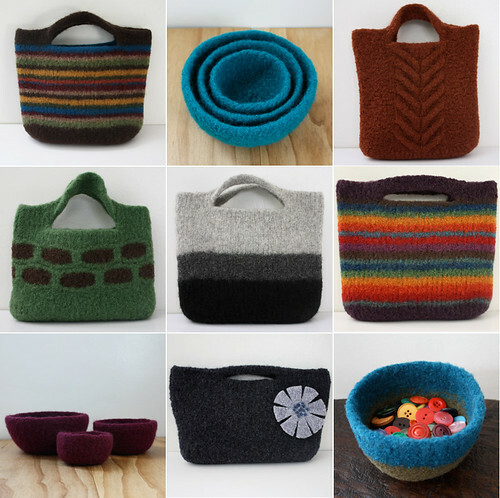 Knitting and felting and hoping to get an online shop going. And, well, what if nobody buys anything? EVER. Then what? But better to have tried than to have not taken the risk, right? Right. Always better to take that risk. So I hope you will take a peek and even if you're not in the market for anything now, maybe keep it mind for down the road. I know times are tight for most people these days. I will probably be posting updates as I add new things and you can always find the shop link over there in the sidebar.